Nepal is the poorest country outside Africa. Education of its children is the long-term answer. few children are getting the education they deserve. You can help us address poverty by training teachers. focusing on the Myagdi District of Western Nepal. in Nepal to train teachers and foster better education in schools. Funding from numerous sources including Rotary International (Foundation Global Grants) is helping us to reach an ever-increasing number of teachers. As a Public Benefit Institution, donations are tax-deductible by Australian taxpayers. 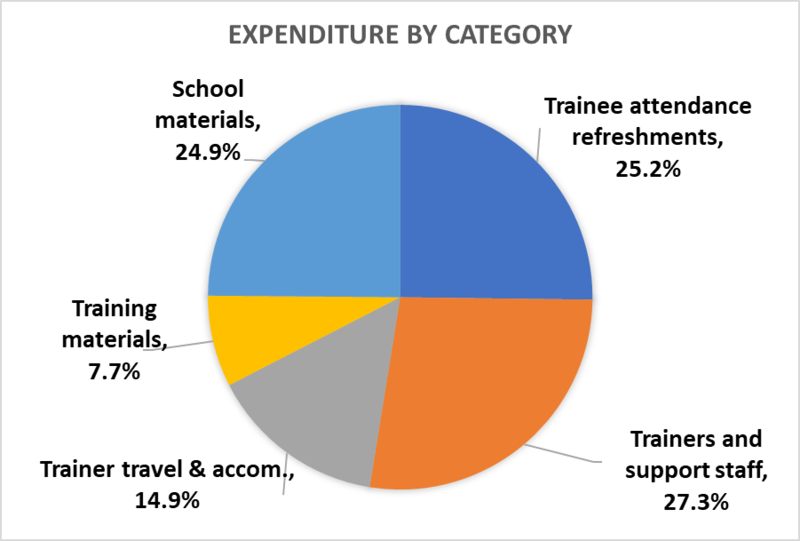 The graph at right shows the breakdown of expenditure for the forthcoming GG1876442 project for teachers of Rakhu schools. Total expenditure equates to US$25 per trainee day. Excluding School materials which are passed to schools for subsequent use, the cost is just US$19 per trainee day. Welcome to all Rotarians who have received our invitation to sponsor a Foundation Global Grant project to extend our training to more teachers through Western Nepal. We are well advanced in gaining the sponsorship we need to apply for a project to cover 80 teachers of the Rakhu Cluster in Rakhugunga Municipality, Myagdi District over three years. Clubs that have committed to sponsorship are listed at left - go to the Rotary Global Grants page for more details. That page also lists the deliverables in the form of the various courses that will be administered by LEARN over the period. We are pleased to announce that RC Corrimal, District 9675, will be the Primary International Sponsor. Clubs on the left have subscribed to a project to start this Rotary year. We are already receiving sponsorship offers for additional projects to further extend the training in the coming year. Please contact us here to join them. Peter and Ronda Hall visited Nepal in November-December to progress the planning of this project and the administration of LEARN generally. Another purpose of the visit was to welcome a party of trekkers from Braemar College, Victoria, Australia to Paudwar village. The twelve students were celebrating the end of their Year 12 studies. They received a very warm welcome from the village. The Eighth Annual General Meeting of Quality Education Nepal Incorporated was held at 29 Blue Mount Road Trentham, Victoria on Sunday the 11th day of November 2018 at 4:00pm. Formal Notice of Meeting (including the Annual Financial Report) is to be found on the Association page, and can be accessed here. The meeting was accessible by Conference Call as advised in the Notice of Meeting. The Australian Government has recently announced program of Friendship grants of up to AU$60,000. We believe we are well positioned to gain such a grant. Not only will it help us in the short term, it will also pave the way for a subsequent application for accreditation with DFAT. At a base level this will yield $150,000 per annum for five years, though it will take a considerable amount of work on our part to qualify. The current round of grants will be particularly helpful, as we have been under pressure from the Nepalese government to direct more of our aid to "hardware" - such things as buildings and furniture, teachers salaries and scholarships rather than teacher training. We remain firmly committed to teacher training as our first priority, but these funds should allow us to provide science equipment, musical instruments, child-friendly furniture, and model classrooms to show just what can be done. We attracted considerable interest at our booth in the House of Friendship at the Rotary International 2018 Annual Convention in Toronto Canada June 23-27. Attended by some 25,000 Rotarians, the Convention had great speakers including Princess Ann, Laura Bush, Helen Clark, Pierre Trudeau, the President of Haiti and the heads of WHO and Unicef. However, my top marks for an inspirational speaker went to Xavier Ramey, 7th generation Afro-American but the first of his family to be born into nominal equality, while still leaving a lot to be achieved. His theme was turning possibilities into probabilities. Can your club contribute to a further Foundation Global Grant project that will allow us to extend our training to further 70-80 teachers? We have expressions of interest by many clubs, but now we need to convert these into sponsorshipcommitments to support an application to The Rotary Foundation. Could your club be one? Please email peter@nepalaid.org.au if there is a possibility. Sponsorships can range from just one or two hundred dollars upwards, and can be paid up front or spread over three years. June 30 has passed, and we have had good response to our appeal for funds. However, the needs continue, and we would much appreciate whatever you can contribute. 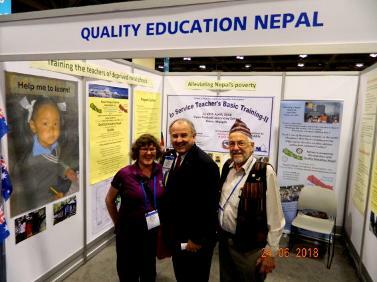 Note that Quality Education Nepal Inc. is a Public Benevolent Institution, allowing it to issue donation receipts allowing Australian tax deductions. Your contribution will support the growth of LEARN, allowing us to provide ongoing annual refresher training after teachers have completed their three-year basic program which may have been funded by Rotary. Visit the Donations page under Contacts to make a donation. * Stephanie Woolard, Rotary Peace Fellow and recipient of the international Rotary Responsible Business Award for her establishment of the Seven Women project in Nepal. Click here to download Peter's presentation. These meetings have engendered support for our training programs in general, and for further Rotary Foundation Global Grant projects in particular. The latter will facilitate the extension of our programs to more and more teachers. We were pleased to be able to entertain the latter at dinner at Nepali Chulo Restaurant together with all four LEARN staff. 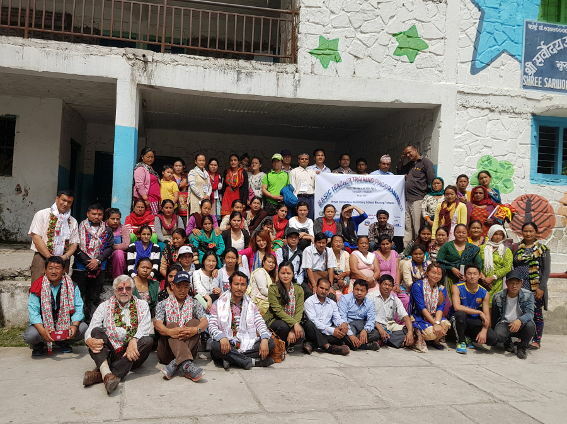 The Closing Ceremony of the second 10-day training program for teachers of Tatopni Resource Centre was celebrated in Dana in the Kali Gandaki valley on April 20. The program, extending over three years, is funded by a Rotary Foundation Global Grant supported by the sponsorship of eight Australian Rotary clubs, three Rotary Districts and eight Nepali clubs. Yam Bahadur Gurung, music and dance trainer; LEARN Training Officer Gopal Dhungel; District Education Officer Ram Kumar Shrestha; Ronda Hall; Peter Hall; Meen Shahi, LEARN Program Manager; Mr. Jayaram Subedi, Resource Person of District Education Office; Krishna Pun, CEO of LEARN; Shanta Bahadur Nepali, Head Teacher of Gyan Prakash Secondary School; Achyut Dahal, Chief Administrative Officer of Annapurna Rural Municipality . CEO Krishna Pun has been joined by Meen Shahi as Program Director and Gopal Dhungel as Chief Training Officer. Both are experienced teacher trainers with Masters degrees. They enhance our capability to extend training to more and more teachers. 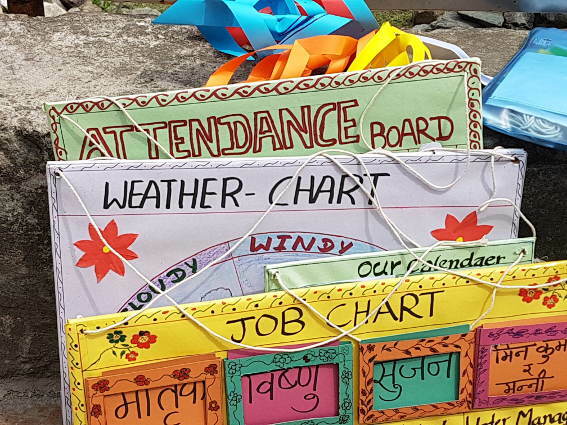 Since the initial 10-day Rotary-funded training program at Tatopani in April 2017, LEARN has continued to deliver training, including in-school support and refresher training for the 150 teachers who have completed their 3-year basic training. The start of a new 3-year program for Phakapani Resource Centre this year will raise the number of teachers in training to 300.